By Kori ~ September 20th, 2012. Would you like a quick suggestion for a good wine to drink tonight (or this weekend) that wonâ€™t break your budget and is widely available? Many of our readers have said this is something they would like, so here is this weekâ€™s selection, the 2010 Chateau Ste. 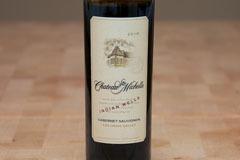 Michelle Indian Wells Cabernet Sauvignon from the Columbia Valley of Washington State. Chateau Ste. Michelle is Washington Stateâ€™s founding winery with its roots dating back to the repeal of Prohibition. In 1976, Ste. Michelle built a French-style chateau in Woodinville, just northeast of Seattle. While all of their white wines are made in Woodinville, all of their red wines are made at Canoe Ridge Estate in eastern Washington. The fruit for this Cabernet Sauvignon was predominately sourced from vineyards in the Columbia Valley and Wahluke Slope, including Chateau Ste. Michelleâ€™s Indian Wells Vineyard. 2010 Chateau Ste. Michelle Indian Wells Cabernet Sauvignon (Columbia Valley, Washington): 89% Cabernet Sauvignon, 6% Syrah, 3% Malbec, and 2% Cabernet Franc. Deep, dark purplish red in color. Nice nose with chocolate, black fruit, and cinnamon aromas. Blackcurrant, black cherry, chocolate, and leather come through on the palate. Medium to full-bodied with crisp acidity, medium to high tannins, and a long finish.